We are now on 401 highway in Ontario Canada. mileage 55,995. Gas is a whopping 56 cents a gallon. wow. Kingston, Ontario mileage 56,088 gas is 57 cents a gallon. Goodness, it is getting worse! We read in the newspaper back at a rest stop that N.Y. has been warned that smog content is dangerous. Just seems natural that this would be true but they have to put that in the paper? All along the Ontario and Quebec highway there has been a haze of smog covering everything. Perhaps it is the lack of wind and sultry atmosphere. I especially enjoyed the “sign-language” signage along the roads. A leaping deer, a spoon and fork, a picture of a fire with a line through it. The line through it apparently means “not permitted”. Also every sign in English is in French also. We ran into another camper at a rest stop who had been in that park with us last night. He is from N.Y. He said that park was the hottest and buggyist park he’d ever been in. We came through a small rain shower but it just wasn’t enough to change the temperature, or do much good. Heavy smog is in the air now just past Calborne. R. said it was smoke. It seems to be smog from Toronto. We stopped at the Waterfalls Private Campground about 7 P.M. near Brompton, Ontario, Canada. ($3.00)We noticed that the restrooms weren’t too clean and no showers. I was really mad because of this as we had such a hot place last night with no showers. An English lady nearby must have overheard me complaining because she offered the use of her shower in her self-contained camper. 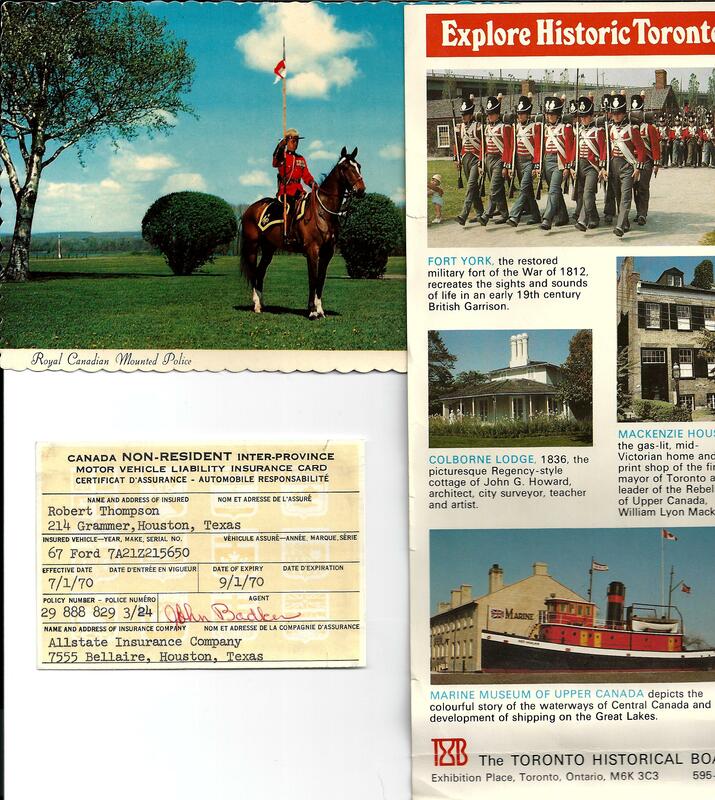 (Her husband was being transferred to Ontario.) It felt so good and made all the difference. It was cool in the night better than in Montreal. After breakfast we packed up and left, after we told our new friends goodbye. Left at 11:15 A.M. That park would have been beautiful, if the sites with water and electric had some shade and the restrooms had been clean and included showers. There was a swim pond, but algae coated the water. There were two pretty waterfalls but no where to swim there. Also a quarry with clear water but rocks lining it were to sharp for kids to swim. Stopped at a fruit stand and got some fruit and 1 gallon of peppers and red onions. ($1.91) The apples were great and so were the yellow plums. I’ve never seen yellow plums. drove past a line of cars waiting to see Niagra Falls. Police were checking cars. We felt sorry for all those people sweating in their cars. mileage 56, 316 and gas is 56 cents a gallon. 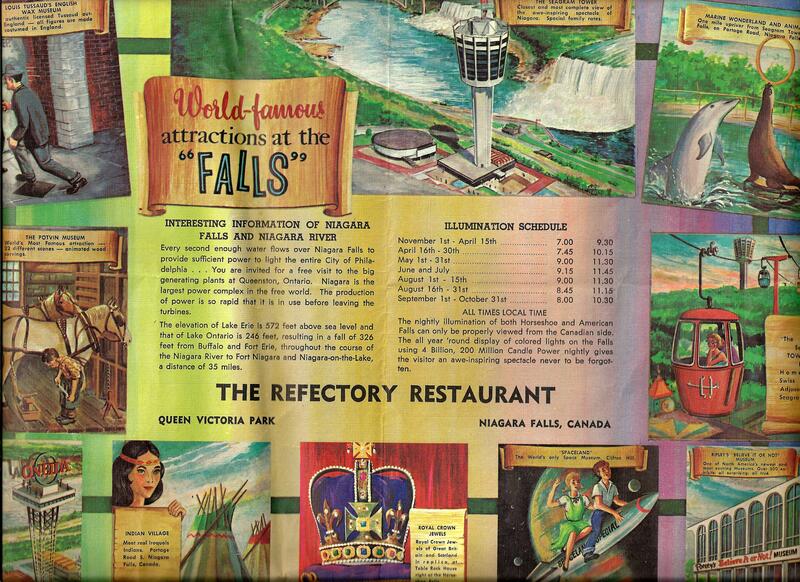 In Guelph, Ontario, we discovered two separate Waterfalls Parks in Brampton in our book. So the mistake was ours. We went to the wrong one. We drove to Guelph Christian Campgrounds. There was no place to put a trailer but it is a very pretty campground. We drove on, to rest, to eat, to find a place to set up camp. The rain came down, heavy. Thunder, lightning, unending and scary. Found a motel – “Prudehomes’ Garden Centre” with motel and swim pool and trailer parks. Stayed in the motel and ate at Beacon Hill Motel Restaurant. It was a very expensive buffet supper but very tasty. ($30.23) I had hair curlers on my head so was a little embarrassed and felt rather silly. No one took notice. The weather was so terrible outside perhaps that’s the reason why. This motel was right on Lake Ontario and the water was choppy in the storm. We got a good night’s sleep and ate a good breakfast the next morning at the motel ($6.35). Still hot and sultry despite the storm last night. mileage 56,723 gas is 58 cents a gallon. The high humidity is unusual for Canada, I understand. We specifically brought heavy clothing to wear in Canada but didn’t need any of it. 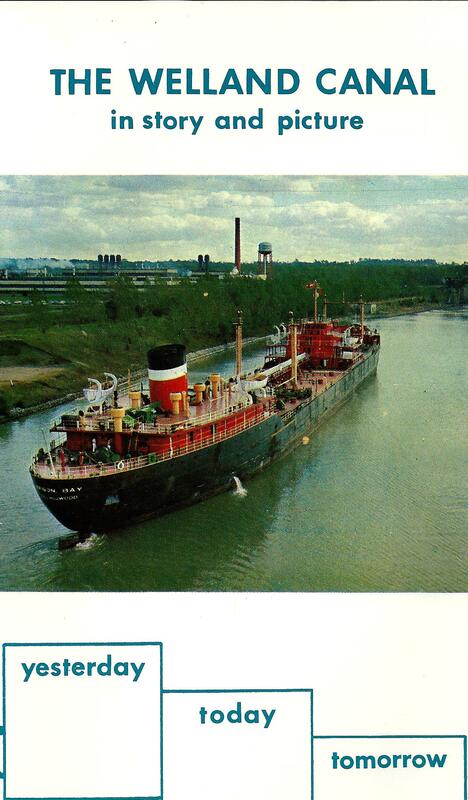 We dressed and drove to see the Welland Ship Canal Lock. We watched big ocean liners being raised and lowered from Lake Erie to Lake Ontario. (.50) The water in the lock was filthy. I think Lake Erie is called the dead lake as there can be no fish in it anymore. Took several pictures (see PAGE of Photos from 1970 vacation). The fruit that we’ve gotten at fruit stands and that we’ve eaten in restaurants in the local area are bursting with flavor. The early delicious apples we’ve been buying taste like apple cider. Got some more just now. 6 for 35 cents – seems very reasonable. We drove the scenic route to Niagara Falls. 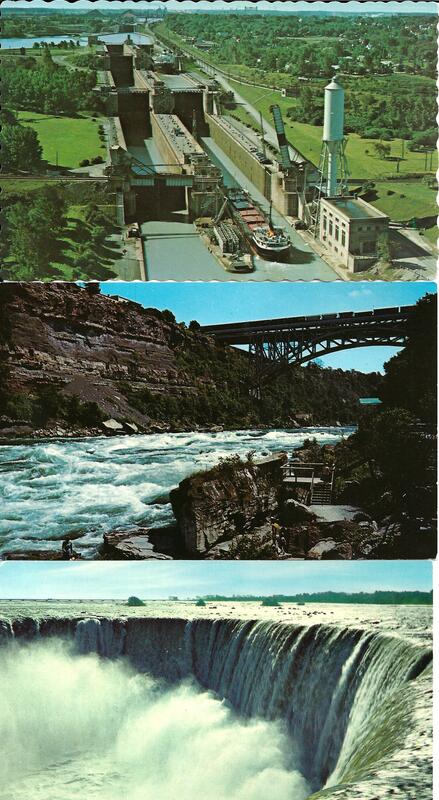 Stopped and saw Niagara Gorge – the green churning water surrounded by high rock banks. Saw a clock set into the bank made of flowers. A nearby horticultural station had a round flower medallion in front. Stopped at a large park and golf course to eat lunch at their restaurant. Sandwiches. Stopped at Niagara Falls and saw the falls. The water was a deep green with white crests and reminded me of green glass with white swirls. The horseshoe falls were best seen from the Canadian side, whereas the American side was also pretty but couldn’t see the true shape of the falls, more like a straight line across. Mist from the falls blew across our windshield. We parked and walked along the railing right above the falls. The roar was incredible. We didn’t even hear the rain come until we were soaked. We ran into the gift shop to get dry. The rain ended and we got quite a few pictures from the American side of the falls. On the Canadian side we saw a round hole with dirty brown water pouring out and mingling with the falls water. Looked like pollution to me. The brown spread across the river. The falls were a breath-taking spectacle. Afterwards we drove back to the motel and got clothes ready for the washateria while kids went swimming. We discovered that the maid had take our personal pillow cases off our pillows. These were expensive permanent press cases, they had been replaced with cheap muslin ones. It made me mad so R said he would say something and see if they would be able to find them. Souvenirs while waiting for rain to stop (spoon $1.31, film $3.41. condiments $2.15, post cards .95, bone ship $1.79, fudge candy $2.15, other things $11.56.) Motel for 2 nights – $37.80. Toll on Hamilton Bay Bridge Shipway .25.
Who can put a price on the experience of seeing Niagara Falls for the first time?